How Long Do Defy Stains Last? How long a stain will last depends on many factors. Climate, weather, sun exposure, moisture and foot traffic are just a few. Stain longevity is also highly affected by proper wood prepping. Before applying any deck stain the wood should be cleaned and prepped correctly prior. This will aid in the performance and longevity of the deck stain. On average most deck stains last a year or two. Another huge factor determining how long a stain will last is the stain quality. A stain like Defy that penetrates extremely well will stand the test of time better than a non-penetrating or film forming stain. 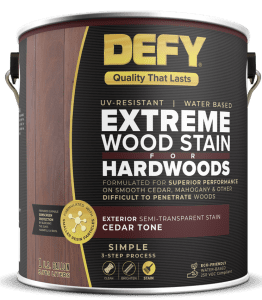 Defy deck stain uses an exclusive technology of zinc oxide nanoparticles combined with synthetic resins that reflect harmful sun rays like no other water based stain on the market. This innovative high performance deck stain showed very little UV fading after 2 years on vertical surfaces. Good color retention was also noted on horizontal surfaces such as deck flooring and handrails. 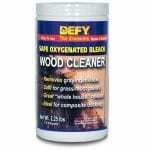 Defy Application InstructionsDefy Questions?Need Help With Defy Stains? After a wood-staining project using any of the Defy stains, it is necessary to clean any equipment or tools that were used. Defy stains are water-based so they clean up easily with soap and water. After staining is finished, dump any remaining stain back into the container and seal it properly. A properly sealed can of Defy Stain will last up to a year or more. Find a safe clean area for cleaning up all your tools, brushes, etc. A large industrial sink or garden hose works fine. Make a solution of water and soap. Dish soap is adequate and warm water works better than cold but is not necessary. 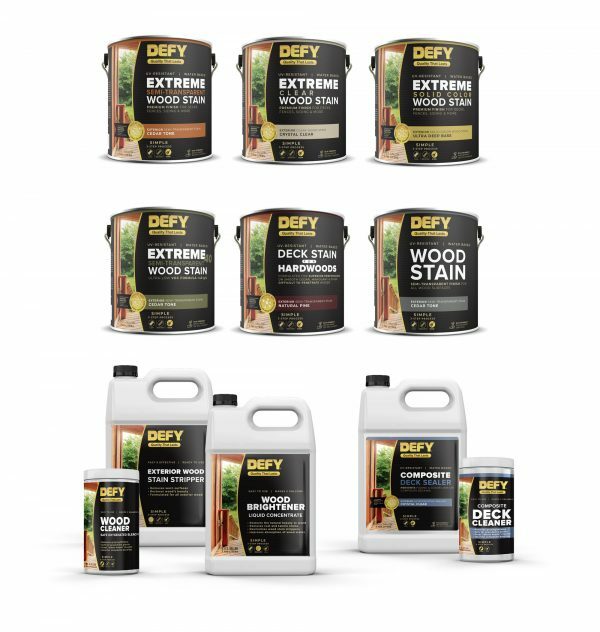 We love hearing from our customers who have used the Defy Hardwood Deck Stains or have questions. We appreciate your input, so feel free to leave a comment below and pictures of your completed projects if you have them. Hardwood surfaces such as Ipe, Mahogany, or Tigerwood are becoming increasingly popular with homeowners for exterior uses. Decks, fences, and other exterior surfaces made of these types of woods are extremely beautiful and provide durability. Like other woods though, they need to be treated with an exterior wood stain to protect them from the harsh elements and weather damage such as rot and decay. 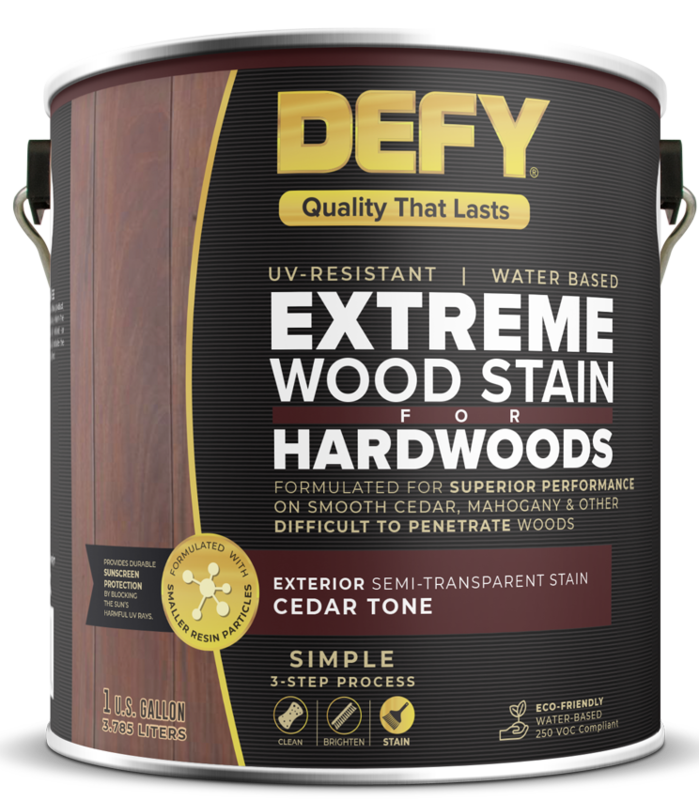 Note: Defy Hardwood Stain also works best for “oil-rich” wood such as Cedar and Redwood.